Descendant of Californias Pineapple, this strain is so good it has a movie named after it. This superbud tastes of pineapple, pine, and cedar. 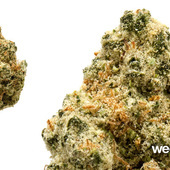 It is a hard hitting Sativa with a very energetic high that has a subtle citrus overtone. Pineapple Express is the famous cross of Trainwreck X Hawaiian. 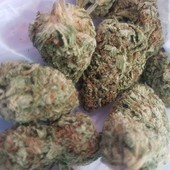 The buds were slightly dense with a strong tropical aroma-less blueberry/cherry; more pineapple/hazy. Despite what I was expecting the inhale brought a sharp, juicy lime-taste from a medium-small bowl in a bong. The buzz is more of a mental high, with some physical aspects creeping in. Though this cut I'm reviewing is only decent, I've seen some amazing PE that deserves to go for $50/eighth.